Mile 75 – Frank L. Melega Art Museum, Brownsville, Pa.
A portion of the recreated studio at the Frank L. Melega Art Museum in Brownsville, Pa. Most towns have monuments, statues or signage to commemorate the accomplishments of past residents of the said town. 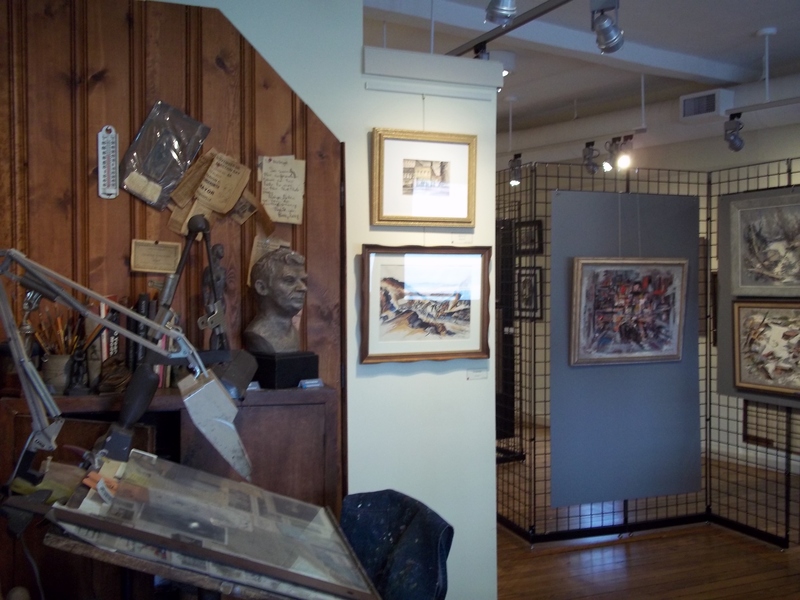 In Brownsville, a museum and art gallery is dedicated to a long-time resident of the area, Frank L. Melega, an artist who lived across the Monongahela in West Brownsville. An Indiana (the state, not the Pennsylvania city) native, Melega’s family moved to West Brownsville during his childhood; his father worked for a local coal mine. Melega produced art for myriad of institutions, concentrating in Southwest Pennsylvania, and received various honors for his work. Melega also operated an art shop in Brownsville. The Melega Art Museum features a variety of work from the late Frank Melega. Melega dabbled in a variety of media during his life, including mosaics, sculpture and paint. His work focused particularly on the region, notably the period when coal and coke reigned in Fayette County and surrounding areas (a history chronicled by the Coal and Coke Heritage Center north of Uniontown). All types of Melega’s work is featured in the gallery, which even includes a recreated portion of the artist’s studio, using actual furnishings. Exhibits are rotated throughout the year, and the museum is home to the National Road Festival Juried Exhibition, which occurs this year from April 21 to May 27, with the award ceremony taking place on Friday, May 18, from 5:30 p.m. to 8 p.m. The art gallery itself is located in the back half of the historic Flatiron Building in Brownsville, and is open to the Brownsville Heritage Center, which takes up the front of the building. In other words, both museums are in the same building and open to one another, making it easy to visit both facilities in the same visit. An exhibit at the Melega Art Museum. The Frank L. Melega Art Museum is open Monday through Friday from 9 a.m. to 4 p.m.; Saturday from 10 a.m. to 2 p.m.; and Sunday from 1 p.m. to 4 p.m. There is no charge to visit the museum. Appointments outside scheduled hours are available by calling 724-785-9331, or by e-mailing barcinfo@barcpa.org or manager@barcpa.org. 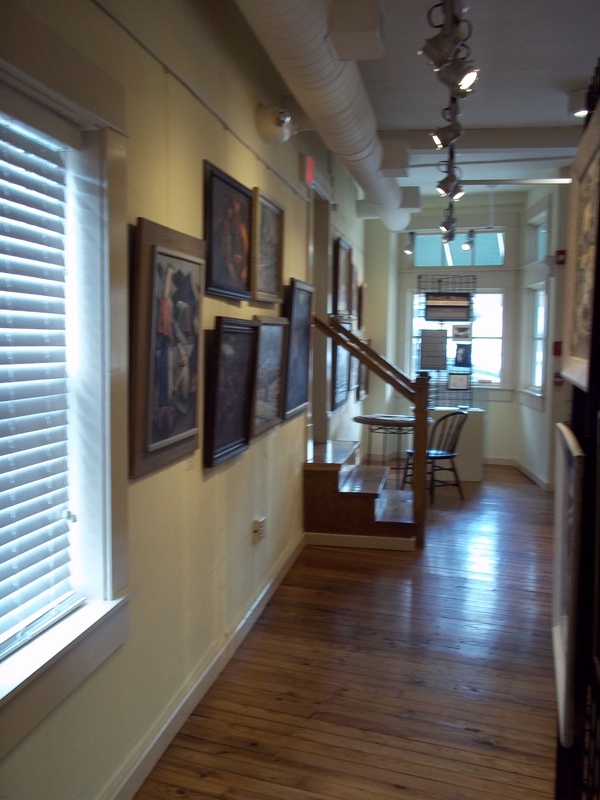 This entry was posted on Wednesday, April 11th, 2012 at 09:00	and tagged with brownsville, flatiron building, melega art gallery, museum, national road, pennsylvania and posted in Brownsville, Fayette County, History/Museums, Pennsylvania. You can follow any responses to this entry through the RSS 2.0 feed. « Mile 75 – Fiddle’s Confectionery, Brownsville, Pa.
Great report. Thank you very much Matt. May I ask that you make one adjustment. Please change the e-mail address to either barcinfo@barcpa.org or manager@barcpa.org. Phone 724-785-9331. 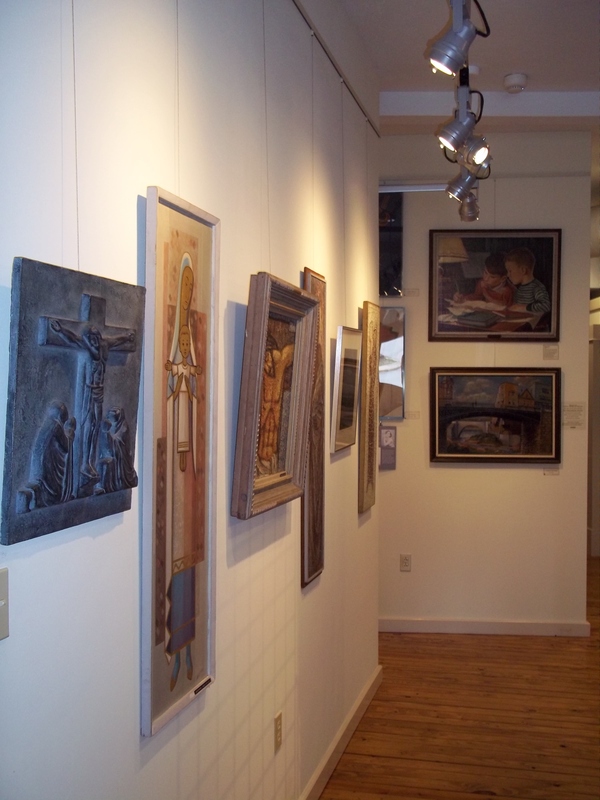 We welcome visitors and also love to share info about special art shows and events. Thank you! I realize contact information can sometimes become out of date, so I appreciate the correction. You’ve done a good job covering Brownsville and its history. You’ve also done a good job covering S bridges further west in Penn and Ohio. One thing I eagerly await is a post about the cast iron bridge over Dunlap’s Creek right in the center of Brownsville. It’s the oldest cast iron bridge in the country, is a significant structure in civil engineering history, and has all kinds of historic markers attached to it. I originally found out about it by reading an article in the SIA journal. Here’s a web page talking about it. Unfortunately, the bridge doesn’t look very significant from the road — it looks like an ordinary bridge. All the interest is in the cast-iron structure under the bridge. To see the cast iron supports you have to climb down a hill and push away a bunch of weeds and brush. Someday it would be nice if the city of Brownsville could make some sort of observation walkway allowing people to see the underside of the bridge, but I can understand that they have more pressing things to spend money on. I did see the marker for the bridge when I was last in Brownsville, but I didn’t know much about the structure underneath. I’ll have to mark it down for the next time I’m up that way. Thanks! great article and thanks so much Matt for your comments. Plans are in the making to have the historic cast iron bridge visible. It is the very first cast iron bridge in America and been in continuous use since 1836. Lots of history in the dear town. Come and visit the Heritage center and hear about the layers of history in the town and the wonderful Melega art that enhances the history of the town. If you have not seen a castle in America, we have that too. Thanks! I was able to visit the Heritage Center in the same trip last year (read here). I’ll also keep the castle in mind the next time I’m in the area. For future reference, all the posts featuring Brownsville can be found by clicking the “Brownsville” category on the right side of the page. Thanks for your encouragement!